Just joined HO a month or so ago. I enjoyed reading the Wine forum on CH before all the crazy changes over there. Glad to have found another place like this now. Any winemakers here ? I guess not necessarily just hobbyists…pros too At the risk of getting a bit too ‘off topic’ perhaps, curious if anyone interested in having winemaking chat threads on here. E.g. good sources of fruit, hardware, & knowledge to get even better at this hobby, and of course, have fun. If winemaking is deemed off-topic though, just let me know; i understand. Any questions, or interest in the hobby itself, please feel free to post ! Welcome pushslice! Of course winemaking posts won’t be off-topic. This site is still growing, and trying to attract food and drinks related new members. So far, wine isn’t the most active area of the forum. As far as I know, there are a few pros in the wine industry here. Why don’t you try to invite your winemaking friends from CH to here to continue the conversations? How many bottles you made every year? Are you really just a hobbyist? That’s a vineyard you have got! Thanks, It’s nice to hear your input. don’t have any friends from CH, but have some from ‘RL’ that may be coaxed onto here; we’ll see. I don’t own any vines (one day…). I typically just network w/in the wine community, and each year hope to end up w/ a handful of options to choose from for buying grapes from the vineyard owners/operators. Thank goodness, w/out any serious crop issues the past decade (i.e. major infestations or freak weather), Northern CA commercial vineyard yields have been good, and thus vineyard owners have been willing to share their bounties with amateur guys like me. I typically make 8-9 cases per vintage. Any more than that, then space becomes an issue for me, and i’d need to move the work out of a garage, and into like the winery where i work. but that’s not something i’m really keen to jump into ATM for several reasons. Nice , whereabouts in nor cal . Always thought about it. Used to make beer. i am in the East Bay, but have sourced my grapes from a number of growing areas in the region. I too, used to brew beer (back in the '90s). but as i started to get into wine more and more, the shift just sort of happened haha. Used to be in Santa Cruz. Now in Mt Shasta. Way cool what you’re doing. And I’m up in Southern Oregon in the Rogue Valley. I post whatever wine news shows up so feel free to join in that thread. i must say, Rogue Valley is one of those up-n-coming producing areas i know too little about. Obviously, your neighbors in the Willamette and Eastern WA get the lion’s share of the PNW wine buzz, but i’ve heard good things about the red varietals in your area. I used to work with a guy who made wines as a hobby. He gave me a bottle of red a couple of years ago that I am still waiting to open. I forgot what it was and it has no label. I’ve seen some houses around Palo Alto Hills and Los Altos Hills where vines are grown in the (sizeable) frontyards. Though that route, compared to you sourcing from multiple places, seem to be somewhat restricting since there is no choice of terroir and varietals. Hope you enjoy those gifts! Don’t wait too long to open 'em. while it’s possible they’re perfectly age-able, most hobbyists I know try to ‘hands off’ as much as they can on their wines, which doesn’t often lend itself to ageing. e.g . as little Sulfur Dioxide addition as possible . a number of those home-estate vineyards across the East Bay as well. While you make a point on the diversity of the planted vines in one’s own small vineyard, I have to say, most of those are ‘vanity’ or ‘lifestyle’ vineyards, IME. IOW, the homeowner liked the idea of having vineyards in their property, but they are being tended by a contracted 3rd party. The homeowner just gets an eventual ‘share’ of the wine that the contractor-winemaker makes from the property’s grapes. This is not every case, mind you, but typically how i’ve seen it go in the Bay Area. Good point. At the time the guy told me I could age it for 2-5 years. I don’t know if he took into account sulfur dioxide. I have 4, 5 vines at home, not for making wine. A few years ago, I was thinking about growing some grapes to eat and took the time to trellis them. But after 5 years, I have yet to taste a single grape. The ‘wildlife’ got to every single one before me. Though I guess if one has a backyard/frontyard full of wine grapes, the animals can’t eat them all. Hi! I’m another northern California (Berkeley) home winemaker, and 2018 is my 21st vintage. I concentrate on Rhone varietals, syrah, grenache, mourvedre (and petite sirah). I used to make zinfandel, but it wasn’t consistent, and I’ve made a couple of pinot noirs over the years. The Rhones are blended in three proportions, syrah/grenache/mourvedre, grenache/syrah/mouvedre, and mourvedre/syrah/grenache; each batch has roughly 70% of the first varietal. Each batch also gets a shot of petite, for color and backbone. I do set aside some grenache to bottle without blending. My first batch was some Amador cabernet sauvignon, and the grapes arrived when my brother was visiting with their newborn daughter. That daughter is now in college, and I’ll be pouring the wine for her when she visits Cal next month (I last opened a bottle of it about a year ago, and it was excellent). that sounds like a fun plan; I’ve saved at least a couple bottles of all my (admittedly fewer) vintages, just so i can also see what kind of ‘legs’ they may have. Rhonestyles are also my favorite (red) wines to drink. Love 'em. I’ve made 2 vintages of Syrah and 1 of Mourvedre. Some of that syrah i blended with another winemaker’s Grenache, before blottling it. I’ve helped another winemaking buddy here in the East Bay make some Petit Sirah , which has turned out excellent so far. I’d love to make some of my own Grenache soon; maybe for the '19 vintage? Grenache tip: The Oak Barrel in Berkeley has provided excellent grenache, grown somewhere around Davis. 2018 is especially promising because the grapes came in a full month later than usual, so they had lots of hang time. I get most of my grapes from Oak Barrel, in fact. indeed; have used OB for some grapes. In fact, my first Syrah was from them (Amador Foothills); believe also the Lodi Zin grapes in '13 were from them. They are reliable. I have seen the Grenache futures on offer there; have not yet bitten. Will keep an eye out for this year’s. 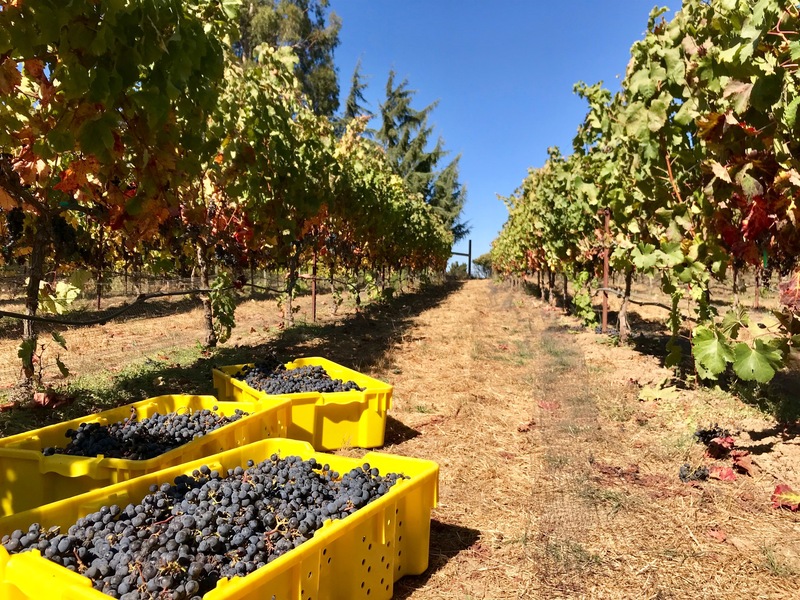 2018 indeed seemed to be a very late harvest for most NorCal reds; we plucked my merlot 2nd week of October, even later than the 2010 harvest! We know one home estate that makes its front yard vineyard available to the UCDavis wine program, of course participating in the eventual output. My wife made pear and plum wine last year. Came out great but we made a lot and now it just kind of sits there in the bucket. We bottled some of the plum but the whole ordeal while interesting was too expensive for us. We ended up buy a lot of gear that we now never use. I should put it on ebay or something. PS: my first post here, just joined today. After a 10 year absence from CH I went back today and boy the pickings are slim! I opened two very nice ones recently. 1997 Amador cabernet (from my first batch) was still going strong. I didn’t get to share it with my niece, born in the same year because of scheduling problems. It’s surprising that it’s lasted this long, because I didn’t sulfite in those days, and the bottles were closed with a hand-corker. 2002 Lodi mourvedre was a surprise. I know that mourvedres generally age very well, but the tannins were resolved and secondary aromas subtle and complex. There was no trace of oxidation. I really have to concentrate more on keeping bottles for the long haul.